The Supermarine Type 379 Spitfire Mk.XIV was a British fighter developed during WWII. It was the most important of the Griffon-powered Spitfires, and the only one to see significant wartime service. 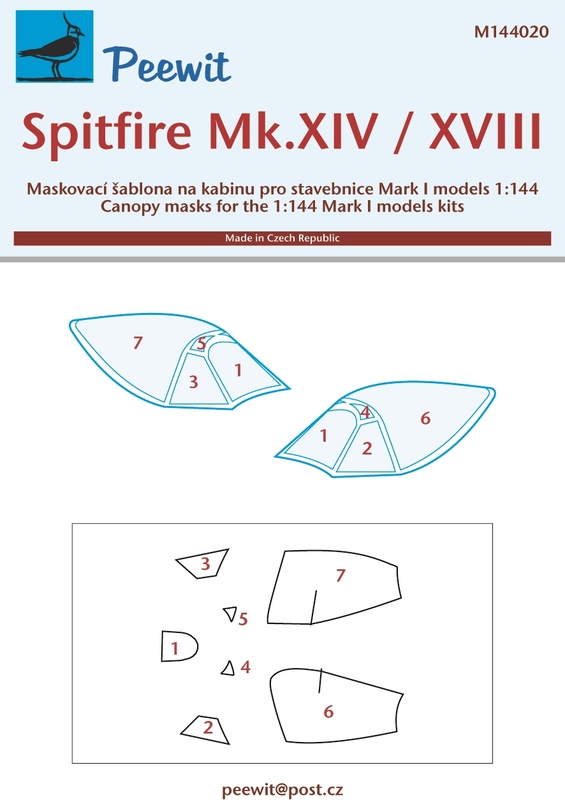 Based on the Mk.VIII fuselage, the first development Mk.XIV flew early in 1943. Initially the aircraft were produced with high-back fuselage, but later cut-down rear fuselage with a teardrop canopy was introduced. It was a single-seat monoplane aircraft, of all metal construction, powered by a two-stage supercharged RR Griffon engine. Early aircraft used full-span C-type universal wing, with two 20mm cannons and four 0.303" (7.7mm) machine guns, while later production aircraft were fitted with the E wing mounting two 20mm cannons and two 0.5" (12.7mm) MGs. Fuselage fuel tank or up to 1000 lbs of bombs (500lb bomb in a FR role) could also be carried. Spitfire FR Mk.XIV and FR Mk.XIVE were fighter-reconnaissance versions with an oblique F.24 camera installed. Both variants had clipped wing tips for low-level use. Deliveries began in October 1943 and the production of Mark XIV variants totalled 957. A number of RAF units were operational in Europe up to the end of war, while introduction of Mk.XIVs into Far East theatre in June 1945 was too late for wartime use. However, the aircraft went on to serve in both regions postwar. In the late 1940s Spitfire F.XIV/FR.XIVs were also delivered to Belgium (a total of 132 a/c), India (20) and Thailand (30).